The dew point tester PT-DPM is an electronic handheld measuring instruments. Climatic parameter are measured fast and with high accuracy by the dew point tester PT-DPM and records the measured values if needed. The dew point tester PT-DPM is surrounded by a solid housing. At the bottom side of this housing you will find the exchangeable head with integraded probes, which is contained within the delivery content. A further exchangeable head for measurements with a discharged temperature detector is optionally available of the dew point tester PT-DPM. The dew point tester can be used for several needs, because of its different calculated measurement values. 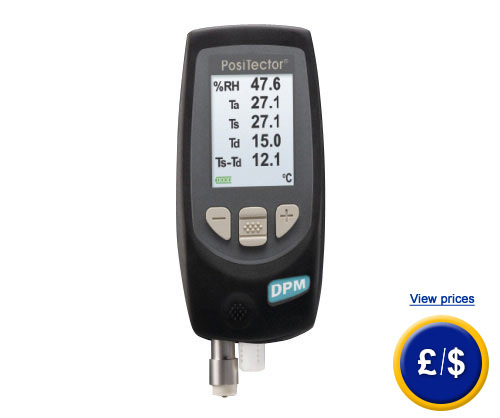 The dew point tester PT-DPM records relative humidity as well as the air temperature. Also the surface temperature, the dew point, evaporation temperature and even the difference between surface- and dew point temperature are shown on the large LCP display in a well-legibly way. The dew point tester PT-DPM has got an integrated alarm system, which will give you a signal in case of bad climatic conditions. This alarm is acoustic and visual. 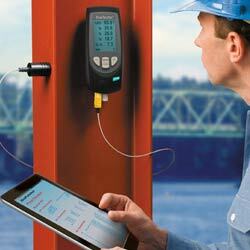 The dew point tester PT-DPM is a really robust device that can be used indoors and outdoors. 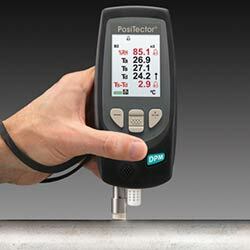 Furthermore, the dew point tester is resistant against solvent, acids, oil and dust. This fact underlines the wide field of applications. Through its shock-absorbing housing of the dew point tester, which consists of robust rubber-holster, there will not occur any problems in case of short drop heights on a hard ground or a collision with another solid object. We offer a guarantee of two years for the dew point tester PT-DPM and also on the corresponding sensor. The measured data of the dew point tester PT-DPM can be stored in the memory and be easily transmitted to a PC via the enclosed USB cable. (A special software is not required.) The Auto Log Mode saves all 5 values in the dew point tester automatically. Smart Trend indicators identify equality and disparity of the measured values compared to the dew point. 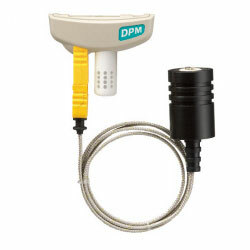 The easy and multisided appliance of the dew point tester PT-DPM makes the use very pleasant for the user. The dew point tester offers a huge variety of display languages and features a adjustable contrast to the bright or dark environment. The LCD display is also flexible, so that the display can be seen from several positions. A user's manual with several illustrative videos regarding the application of the dew point tester PT-DPM can be found in the web. If you have further questions concerning the dew point tester PT-DPM, please take a look at the following technical data or call our hotline: UK customers +44(0) 23 809 870 30 / US customers +1-410-387-7703. Our technicians and engineers will gladly advise you regarding the dew point tester or any other product in terms of regulation and control or scales and balances by PCE Instruments. Will work via battery or continuously via USB. Batch-annoation- create significant names and enter Batch-notes directly on the device.